Until joining my African-American book club I had not heard of author J. California Cooper even though she is the winner of a National Book Award for Homemade Love (1989). Why is this? After all I’m fully aware of story tellers such as Toni Morrison, Edward P Jones, Terri McMillan, E Lynn Harris. Bebe Moore Campbell etc… Have I been living under a rock? 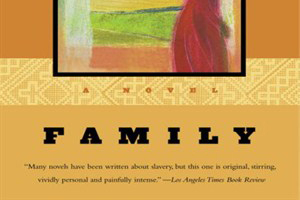 In any case, I have been reading her first novel Family, published in 1991, and I am swept away. On the face of it, this novella is about slavery. However under the skin and bones it is a beautifully rendered tale of human endurance and hope, no less because the tone the main character uses to tell the story of her family is not engulfed in anger or bitterness. Instead the sytle is both lyrical and crisp and perfect for allowing the reader to absorb brutal details without getting too heart sick to continue. In fact the novel ends on a note of hope and connectivity, a real feat to pull off given the subject matter. I love the way Cooper playfully wrestles and uses word play to present the concept of time and the times in this novel. Her style reminded me of Khalil Gibran whom I used to read a long, long time ago once upon a time, so I was defintely tickled to see him listed in her dedication. I so recommend Family, a little treasure of a read with a big heart. And look forward to reading more of Cooper’s work. look endless. That’s the time I was born. there was fields named Lester, Ruby, and Lark, and whole lotta cows named Satti. remind you that everything ain’t never gonna be alright!